rubellite tourmaline, pyrope garnet, spinel, ruby. sapphire, spinel, topaz, kyanite, labradorite, iolite, aquamarine, tanzanite, lapis, apatite, tourmaline, moonstone, turquoise. 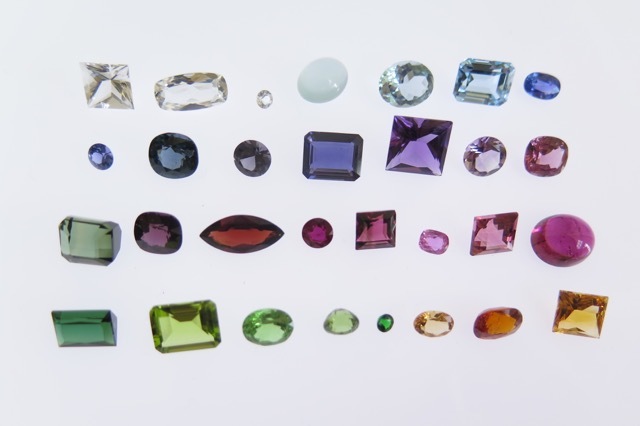 Spinel, sapphire, morganite, beryl (aquamarine), tourmaline, pink quartz, kyanite, diamond. citrine, sapphire, beryl, tourmaline, amber, tigers eye, sunstone. mandarine garnet, gold topaz, fire opal, tourmaline, spessartite garnet, moonstone. The 4 C’s, when referring to diamond value, are color, clarity, carat weight and cut. All four factors are equally important in determining the final cost of a diamond. The criteria for diamond grading, most respected internationally, was developed by the Gemological Institute of America (the G.I.A.). The terminology and systems described on this page, are those of the G.I.A. Following, is an explanation of these terms. The color of a diamond refers to the relative amount of yellow, brown or gray body color that a stone possesses. The G.I.A. scale starts at “D” and goes through “Z”, with “D” being void of any body color, and “Z” having a light yellow, brown or gray color. Practically all diamonds contain naturally occurring internal characteristics called inclusions. The size, nature, location and amount of inclusions determine a stone’s clarity grade and affect its cost. Clarity is determined using 10X magnification. By definition, if something is not visible at 10X, it does not effect the clarity. I1-I3= Obvious under 10X, may be visible to the unaided eye, I3’s inclusions may effect the stone’s durability. Carat is a unit of weight, not size. There are 5 carats in a gram. The weight of a diamond is measured in carats. 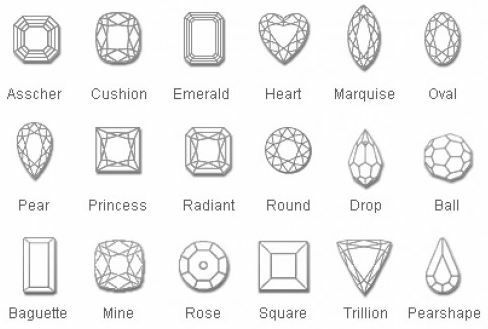 A carat is divided into 100 parts, called points. The quality of a diamond’s cut makes all the difference in how the stone appears. A poorly cut “D”, Flawless stone, can look dead and lifeless, whereas an ideally proportioned diamond of much lower color and clarity will appear radiant and dazzling. So, why aren’t all diamonds ideally proportioned? The answer is quite simple. Diamonds are sold by weight. Stones cut to ideal proportions waste more of the diamond crystal, therefore weigh less than stones that are cut to maximize weight.